The power above is . 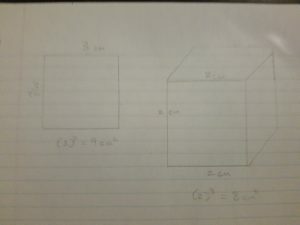 Powers have a base and an exponent. The base (3) would represent the number multiplied by the exponent (4) as shown in number one. The exponent is how many times 3 would be multiplied. This power would be the equivalent to 3x3x3x3. 5) Evaluate powers with integral bases (excluding base 0) and whole number exponents. With , the repeated multiplication would be (-2)(-2)(-2)(-2) which would equal 16. With , You are applying the exponent of 4 to the base of 2, then you will apply the negative symbol in the form of -1. With , You are essentially doing the same thing as . 7) Explain the exponent laws for multiplying and dividing powers with the same base. 8) Explain the exponent laws for raising a product and quotient to an exponent. When raising a power to an exponent you keep the base, multiply the exponent(s), and if there is a coefficient, apply the exponent to the coefficient. 9) Explain the law for powers with an exponent of zero. Any base (except 0) with an exponent of zero will equal 1. 10) Use patterns to show that a power with an exponent of zero is equal to one. 11) Explain the law for powers with negative exponents. 12) Use patterns to explain the negative exponent law. 13) I can apply the exponent laws to powers with both integral and variable bases. 14) I can identify the error in a simplification of an expression involving powers. When simplifying a power using the power rule, you have to remember to apply the coefficient to the exponent not mulitply them together. With the first example above, the coefficient was multiplied by 3 rather than applied the exponent of 3. This made it equal 6 rather than 8, which is incorrect. 15) Use the order of operations on expressions with powers. I first did the power law which states that the exponents are applied to the coefficients, and the powers are raised by the exponent. Then, I did the product law which multiples the coefficients and adds the exponents of the powers of the same base. 16) Determine the sum and difference of two powers. In equations like this, you would do the power law first. However, the negative exponent law was done first, here is the result. 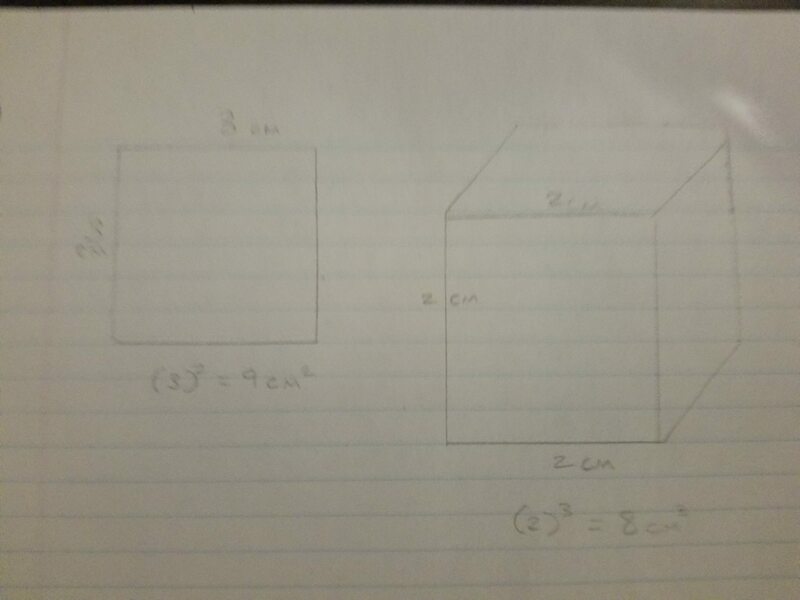 The side length of a cube is 5 cm, what is the volume of the cube? A bacterium quadruples itself in 1 hour, How many will there be in 5 hours? The base represents how many bacteria are produced, and the exponent represents time (5 hours). 20) Applying the order of operations on expressions with powers involving negative exponents and variable bases.